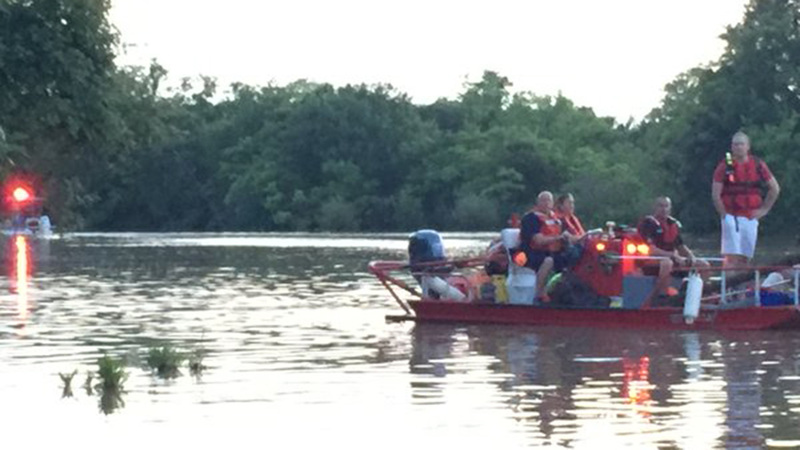 LEAGUE CITY, TX (KTRK) -- A search is underway for a man who fell off a boat in League City, police said. League City police say they were notified around 6:23pm that 46-year-old, Patrick Mathews from Friendswood had gone underwater in Clear Creek near Shady Lane and Palomino Lane. According to Texas Equusearch, Patrick was wearing long, Army green cargo shorts, has a large scar on the back of his head, and the name "Cody" tattooed on his arm. Police say he was in the boat with his 10-year-old son and nine-year-old friend. Two witnesses said they saw the man jump off the boat, briefly resurface and then disappear again. The man was not wearing a flotation device. One of the witnesses called police while the other went out to the boat to get the kids and bring them back to shore. Several agencies in the area are aiding in the search. We're still gathering more details on this story, so stay with abc13.com and Eyewitness News for the latest updates.